The anti-glare high-res screen. I had been holding off on upgrading to a newer MacBook Pro because I absolutely detest glossy screens—I owned a MacBook with a glossy screen once, and gave up on it after only a few months. (My Mac Pro, too, is connected to nothing but anti-glare displays. Mirrors are great, but not when they’re also my monitors!) 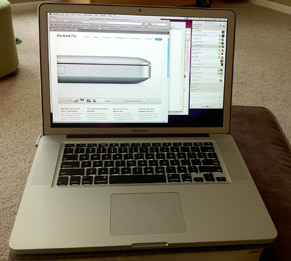 At first, only the 17″ MacBook Pros were available with anti-glare screens. But when Apple added an anti-glare display option to the 15″ MacBook Pro, I felt it was time to upgrade. I was a bit leery, though, that the screen resolution might be too high for my aging (but still 20-20) eyes. Some in-store time with the machine (thank you, Apple, for stocking at least one anti-glare model in our local retail store) allayed those fears. In fact, after only a few minutes with the high-res display, everything on the screen of a nearby 1440×900 MacBook Pro looked absolutely huge. Having worked with the display for a few weeks now, there’s no way I can switch back to a lower resolution—the 36% greater pixel count is most welcomed for everything from web browsing to working in Coda. It even makes it possible to use Screen Sharing to my Mac Pro (running at 1920×1200), and work in a scaled-to-fit window without much difficulty. The keyboard. Previous to this MacBook Pro, my favorte laptop keyboard was the one found on the 12″ PowerBook G4. That keyboard was so solid, it felt like it’d easily handle a 20-pound rock dropped on it from a couple feet in the air. My 2008 MBP’s keyboard was decent, but it definitely had more ‘give’ in it than I prefer. This new one, though…if it’s not as rock solid as the G4’s keyboard, it’s very very close. I much prefer typing on a solid-feeling surface, and this machine has that requirement handled. The speed. I never felt my old MacBook Pro was really slow…but wow, this new one is really fast. There’s always that “I just spent money on a new Mac, it must be faster” emotion, of course, but really, this one is faster. I test-ripped a couple of DVDs, and this machine is basically neck-and-neck with my desktop four year old Mac Pro, powered by two 2.66GHz Xeon server-class processors. Not bad for a machine I can carry around. I haven’t done much gaming with the new machine yet, but it’s got a much better graphics card than its predecessor, so I’m expecting good things. I just need to take the time to install the 60+GB of X-Plane and start flying around a bit. The design. The unibody design of the newest laptop Macs is really something to behold—and hold! At first, I wasn’t sure about the separate keys on the keyboard, but it feels completely natural in use. While the anti-glare screen isn’t quite as nice looking as the mirrored, er, glossy screen (as it lacks the black surrounding bezel), the end result is still one nice, elegant laptop. The lack of a latch. This is a minor thing, but it’s something I notice every time I open or close the machine, so I notice it a lot. I never gave much thought the old MacBook Pro’s locking mechanism. However, after using the new one’s dead-simple “just open or close it” no-latch design, the old method now seems quite complicated. Nothing to fumble for in the dark, just grab the lid and lift. Simplicity in action. So those are some of the reasons why this is now my fave-ever Mac laptop. Of course, I’m publishing this the night before an Apple announcement, where it’s widely anticipated that some new MacBook Air models will be displayed. Still, even if my dream 11.6″ 1440×900 MacBook Air comes out tomorrow, I’ll still be thrilled with my 15″ anti-glare high-res machine. I love the screen, the resolution, the solid keyboard, the design, and the overall “carved from a hunk of metal” feeling of this MacBook Pro. So you like the keyboards on the new ones? That is the one thing I love the most about my early 2008 MacBook Pro, and the one thing I look forward to the least for whenever I get a new one. Personally, the squishiness makes for super-fast typing. Everything else sounds great though, especially the large trackpad (which you don’t mention). Also, the speed is likely attributable to the solid state drive. Friends with PCs with entire hard drives that are those things (like notebooks) tell me that they are super-fast. Nice, we are rocking the same favoritest laptop. Can’t live without the anti-glare. My solution to the disk speed issue was more costly though. Removed the optical drive and inserted two 500GB full-on SSDs! FASSSST!